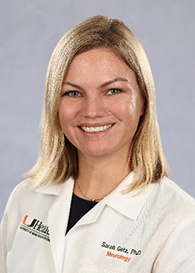 Sarah Getz, PhD, is an instructor in the Division of Neuropsychology, in the Department of Neurology of the University of Miami, Miller School of Medicine. Dr. Getz earned her doctorate in psychology with a specialization in cognitive neuroscience at Princeton University in 2013. Her dissertation research focused on the role of cognitive control in decision making processes. She completed her clinical training in Boston, including advanced externships at Harvard Medical School, and her clinical internship at the Miami VA Medical Center. Current lines of clinical research include investigations into the role of lifetime emotional factors in developing the frailty syndrome as well as cognitive and socio-affective correlates of scam susceptibility and deception. Current efforts are also focused on screening measures and primary interventions to reduce deception among vulnerable elderly.